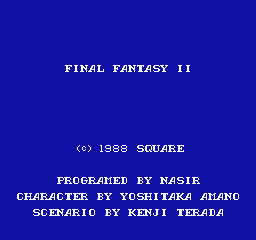 This is an unofficial, independent addendum patch for Demi’s FF2 translation translation done by Demiforce in 1998. 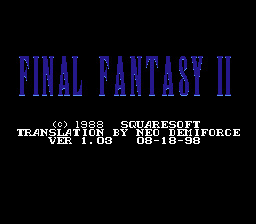 If you’ve ever played Demi’s FF2 translation on a modern NES emulator you’ve probably noticed the glitchy graphics that appear instead of the fade effect. This patch corrects coding errors and makes the titlescreen fade correctly.